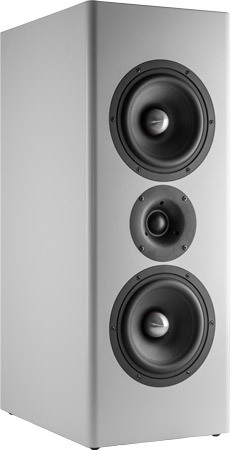 Compact loudspeaker Atlas is an high-end 2 way speaker with high efficiency. The kit is delivered with tweeter Wavecor TW030WA11. This tweeter is perfect for applications with deep crossover frequency. Two Wavecor woofers WF182CU13 with phase-plug and very linear frequency response are within the closed cabinet. Atlas impresses with high volume stability and brilliant sound reproduction. We recommend this loudspeaker. The crossover consists of a 3rd order high-pass filter (18 dB per octave slope) for the tweeter. A blocking circuit smoothing the frequeny response from 3 kHz to 10 kHz. The Woofers are connected to a 2 nd order (12 dB per octave slope). A series-resonant-circuit is used to smoothen the frequency response at 800 Hz. The frequency response of this speaker a very linear. The decay spectrum is nearly perfect. At low volume, i.e. 85 dB at 1 m, the nonlinear distortions are not higher than 0.1% between 500 Hz and 10 000 Hz and doesn't exceed 0.5% at 95 dB at 1 m. These are the advantages that are hard to exceed.